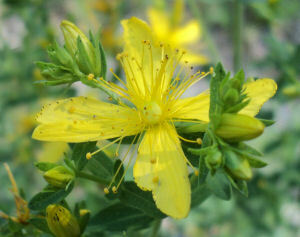 "Hypericum perforatum is a PERENNIAL growing to 0.9 m (3ft) by 0.6 m (2ft in). It is hardy to zone (UK) 3. 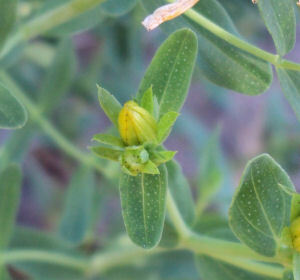 It is in flower from May to August, and the seeds ripen from Jul to September. The flowers are hermaphrodite (have both male and female organs) and are pollinated by Bees, flies, self.The plant is self-fertile." Daily dosage: 2–4g crude drug (32). Inflorescence: generally terminal cymes, bracted. Flower: sepals 5; petals 5, deciduous or persistent, generally ± yellow; anthers occasionally black-dotted; ovary chambers 1 or 3(5), placentas 3(5), axile or parietal, projecting into chamber. "Hypericum androsaemum is a deciduous Shrub growing to 1 m (3ft 3in) by 1 m (3ft 3in) at a fast rate. It is hardy to zone (UK) 6. It is in flower from Jun to August, and the seeds ripen from Aug to September. The flowers are hermaphrodite (have both male and female organs) and are pollinated by Insects, self.The plant is self-fertile." "Suitable for: light (sandy), medium (loamy) and heavy (clay) soils and prefers well-drained soil. Suitable pH: acid, neutral and basic (alkaline) soils and can grow in very acid and very alkaline soils. 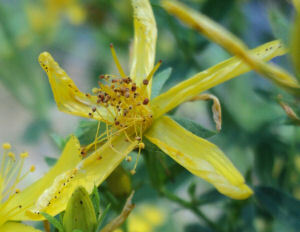 "(Hypericum androsaemum) The black berries are often viewed with suspicion by country people. In the Hebrides, for example, they say that if you eat them, you will go mad (Murdoch McNeill)....Actually, the leaves do have antiseptic properties, and they were certainly used to cover open flesh wounds before bandaging became common (Genders. 1971)." Gerard "...recommended it for burns and there are other ailments that have been treated externally by either the leaves or roots in some kind of ointment." All five species have been used for similar purposes in Britain. "Most applications have arisen from its astringency and power to staunch bleeding. H. pulchrum has also shared with H. humifusum a role in curing stomach upsets. An infusion of ‘St John’s-wort’ (species unstated) has also served as an old rustic remedy, in an unidentified part of England, for enuresis in children or the aged.12 Hypericum pulchrum has been widely in use for low spirits, nervousness and as a general tonic. St John’s-wort used for healing fractures and sprains—in the manner of comfrey (Symphytum officinale) and royal fern (Osmunda regalis); Hypericum perforatum has been used for those in Somerset, H. pulchrum in the Highlands and, mixed with goldenrod and heath speedwell, on Skye." "When cut and bruised, a resin-like substance can be extracted and has been applied as a protective coating to various afflictions such as burns, and bed sores. Used for warts. An infusion for coughs or catarrh and to make hair grow."